My grandmother Catherine always said, “Try it, you'll like it!” I'm not quite sure what she'd say about the latest culls from the garden. This year I had a number of volunteer potato plants show up (I guess we weren't quite as thorough as we should have been last fall). Never one to pass up easy to grow food, I let the little seedlings wander on their way. UNTIL – the seedlings were no longer little, and were on their way to turning into an impenetrable thicket, threatening to completely smother the plants that I actually wanted to grow in those beds (in this case, ground cherries, peas, broccoli and petunias). Time for some tough love – out they came. There were around a dozen plants, but it's been really dry, so I only ended up with a few pounds of what resembled nothing so much as small purple rocks. 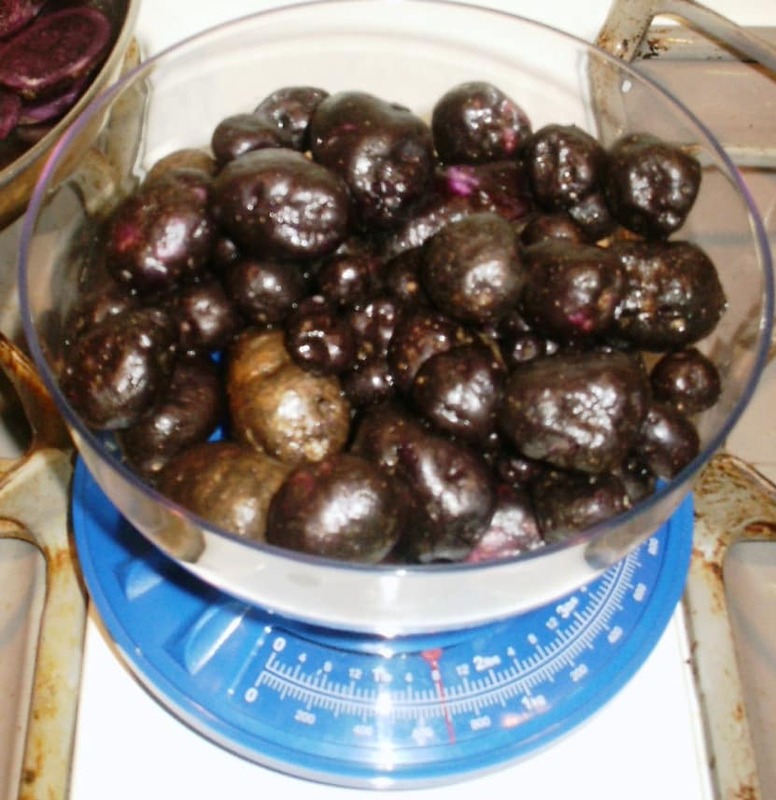 These are Peruvian Purple potatoes – dry little fingerlings that produce no matter what kind of weather you throw at them. Hot, cold, wet, dry – bring it on! I freely admit, they are not my favorite potato in terms of taste – that honor goes to Yukon Gold – but they are tough. I plant one small bed and have enough for us and for our friends and to share with the local food pantry. Often strangely phallic in shape when fully mature (but that's a story for another post), these heirloom fingerlings are a deep purple color all the way through. It can be a bit disconcerting, as they sometimes cook up purple and sometimes cook up blue, depending on the dish. It gives one the bizarre impression of eating muppet chow. They make a perfectly functional potato salad or scalloped potatoes and are good for roasting. I had a taste for German Potato Salad, which was a little dry (these are a very dry potato, not a waxy, which was recommended by the recipe), but it sure looked pretty. There was fresh parsley and celery from the garden, coupled with bacony goodness….mmmm….bacon. Combine the potatoes with 6 cups salted water in a medium saucepan. Bring to a boil, then reduce the heat and simmer until the potatoes are tender, 5 to 10 minutes. Reserve 1/4 cup of the cooking liquid and drain. Transfer the potatoes to a large mixing bowl and keep warm. Meanwhile, in a large skillet, cook the bacon over medium heat until brown and crisp, about 4 minutes. Remove the bacon with a slotted spoon and transfer to the bowl with the potatoes. Drain off all but 2 tablespoons of the bacon grease. 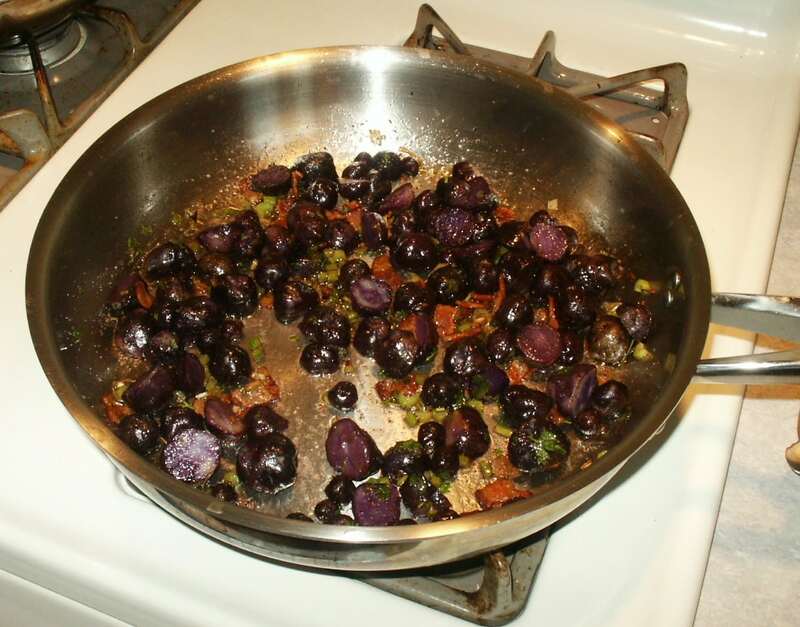 Add the shallot to the skillet and cook until slightly softened, about 3 minutes. Stir in the reserved cooking liquid, oil, vinegar and sugar. Bring to a boil. Pour the mixture over the potatoes and toss to coat. Add the celery, parsley, and salt and pepper to taste. Mix well. Serve immediately. Expand your culinary horizons, eat a rainbow – eat some little purple rocks…try it, you might like it! Yep, that's EXACTLY what they look like – purple rocks. I had a volunteer show up, from the starts we grew from you TWO years ago! Tenacious. Guess they had to be, to survive in Peru…. Can you tell me where I can purchase them to plant? I looked at burpees but they only had purple majesty and they will only ship during the spring 🙁 I would like to try to plant them next month. Not sure when they ship.